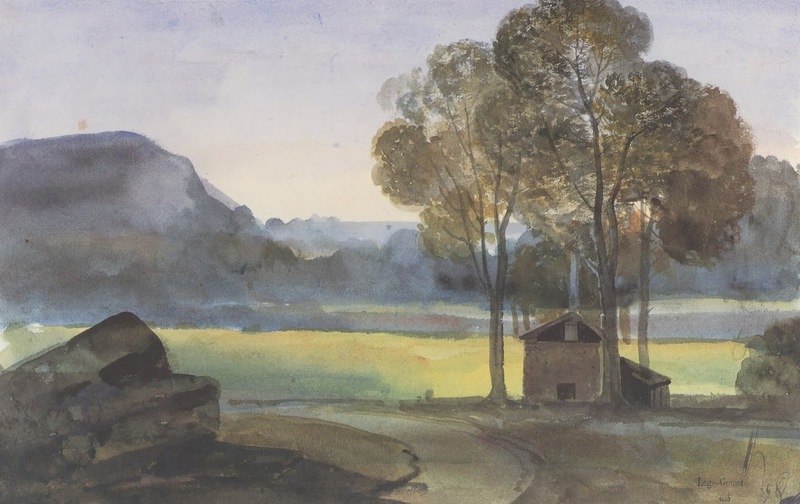 I was captivated by View of Mont Sainte-Victoire from the Terrace at Malvalat (1844, Fritz Lugt Collection, Fondation Custodia, Paris) when I saw it at the Frick Collection in New York a few years ago. Outside the gallery the setting was a dreary day in late Nonmember while inside a sunny Provencal landscape was warm, inviting - and oddly familiar looking. That purple mountain in the background was Mont Sainte-Victoire. Malvalat was the sunny home of Granet's childhood in Aix-en-Provence. And how beautifully rendered. The diagonals of light and shadow that shape the terrace are mimicked by the lavender patches of mountain. Delicate fronds of yellows and greens look as though a breeze sways them while, at the center of the terracotta pot, red blossoms seem to gesture toward Sainte-Victoire. The mountain, visible from many points in Aix, has a considerable history. The Scottish novelist Sir Walter Scott, in his novel, Geirstein, or The Daughter of the Mists (1824), devoted sixty pages to the character of Sainte-Victoire as magic mountain, heir to Minerva and Apollo. During his long walks through France, Stendhal recounted how he was accompanied by the highly visible mountain through the Provencal countryside. Farther back, I learned that Papon's Travels in Provence (1780), drew on the letters of St. Jerome, for the story of battles, in 102 B.C. delivered the valley to the Romans from the barbarians. And what about Granet? Francois-Marius Granet (1775-1849) was born at Aix-en-Provence, the son of a master mason. He showed a knack for drawing and his parents indulged his wish for leesons. “But as my poor parents were not overly punctual about paying for the months of lessons, the master was not very diligent about my instruction.” His master was also giving lessons to the Marquis de Forbin, who became Granet’s lifetime friends. Granet lived off and on in Paris for half his life, not always happily but always hoping for professional advancement. On first seeing the city in 1796 the crestfallen 20 year old expressed disappointment “ I kept asking at every turn where Paris was.” While in Paris, he supported himself by painting murals in the homes of the wealthy. Back home, both Granet's parents died, leaving him bereft of family. For solace, Granet immersed himself in studying the collections at the Louvre. The young artist was encouraged by Fragonard and also studied briefly in the atelier of Jacques-Louis David, along with Forbin. But Granet had to leave when his money ran out. The period of 1802 to 1824 was a caesura in Granet's life and career. In Rome he achieved some success with his finely-made, atmospheric architectural drawings. A devoutly religious man, Granet often chose cloisters and monasteries as his subjects. Also, he met the love of his life, Nena Appolini, when he took lodgings with her - and her husband. Surprisingly, the three became inseparable, so much so that when Comte de Forbin, now director at the Louvre, lured his friend back to Paris by procuring him appointment as conservator of the King's art collection at Versailles, all three showed up. But Granet was bound there at all seasons, away from his beloved Rome and from home at Malvalat. After Nena died in 1847, Granet confided in his diary, "My poor head is all confused. I no loner know where I am, and so I have come to hide at Versailles for a month. Here I have the space to turn over my dark thoughts. 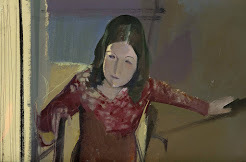 Sometimes i write them down and other times I paint them, but I am understood by no one; I am alone in the world." Sorrows accumulated and served to isolate Granet from all but a few close friends. Although he and Nena were finally able to marry in 1840, she died in 1847. He enjoyed only a brief retirement to home in Aix. His most personal creations, he thought, had a "sad character which repels men of our era." 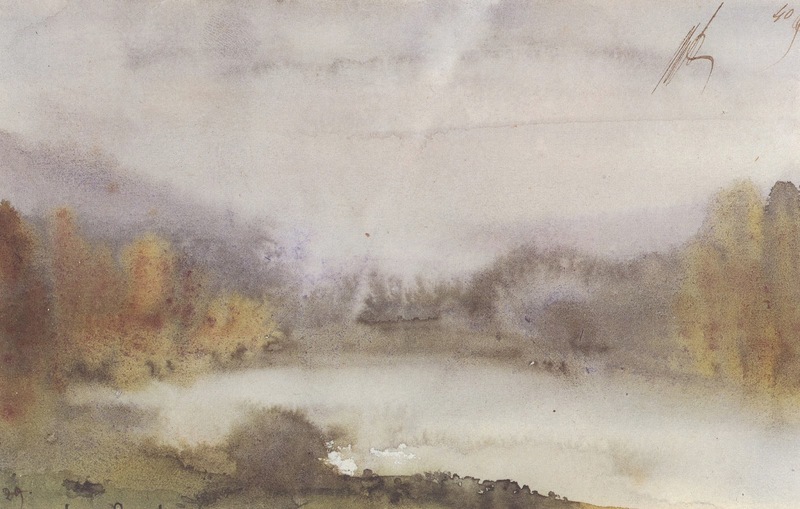 Neither the watercolors nor the memoirs were ever intended for the public, yet they are among his finest creations. 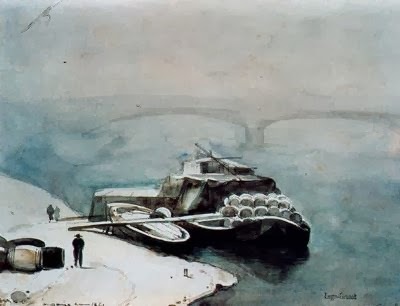 Barge loaded with Barrels - Pont du Carrousel in the Background, 1841. At the time Granet painted this, he was in Paris and concerned for the declining health of his dear friend Forbin. The Seine was not frozen so the cold air created a mist above the water that made the bridge in the background appear farther away than it actually was. The only warmth in view is the barrels on the barge - they were full of wine. Interior and terrace of Granet's quarters at Versailles, Thursday, August 26, 1841. On the evidence of this picture, Granet arranged his surroundings to remind him of home at Malvalat. 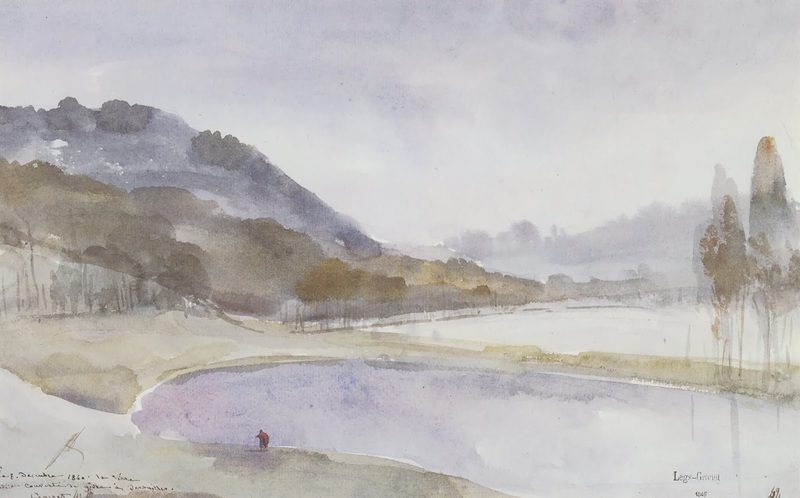 Given how precisely the artist dated most of his drawings, though he had no thought to show them publicly, we may wonder if he used them as aides memoires or memory devices for his contemplative moments. We do know that throughout his life Granet was and remained devoutly religious. Balustrade and south end of the Parterre du Midi with the Bosi de Satory in the distance, no date given. 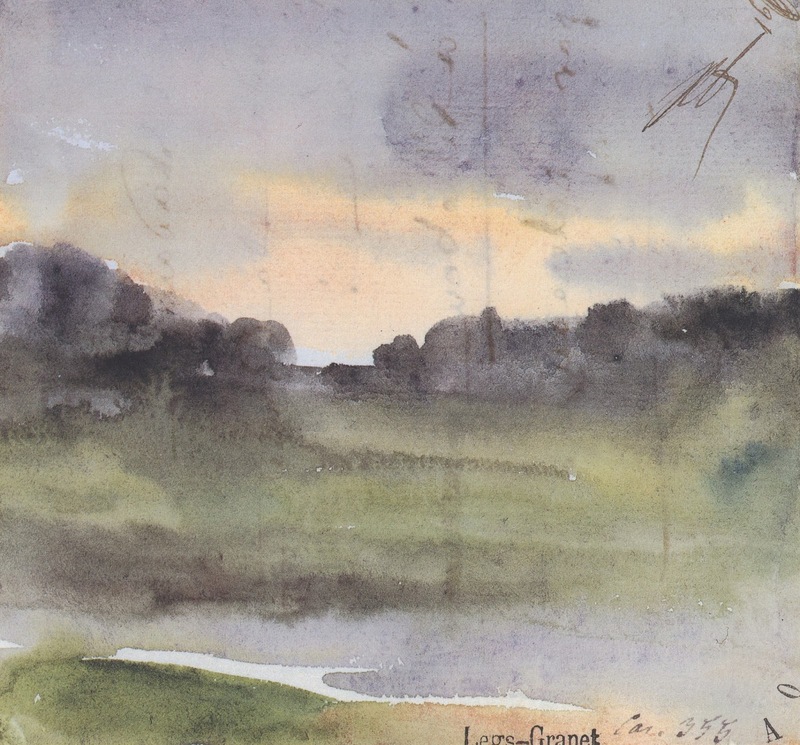 Granet made only two known drawings of this spot at Versailles, but this is where he often set himself up to draw. A popular guidebook of the time, by a M. Vaysse de Villiers, describes this spot as "offer(ing) the most beautiful view the palace enjoys, not for its extent, but for its charm." West Cent Marches (Stairway of One Hundred Steps) as seen from the Orangerie, February 27, 1841. You have to look closely to see them, but those dark little verticals are human figures put there by the artist to indicate the scale of the architecture built for the 'Sun King', Louis XIV, in the 1680s. Piece d'Eau des Suisses sous la neige (Pond of the Swiss under the snow) , March 29, 1840. The nature-formed pond had been enlarged into a lake as part of the grand expansion of Versailles from a hunting lodge surrounded by bug-infested swamps to a royal showplace. Such projects were carried out by soldiers from the King's army, in this case the Swiss Guards, for whom the renovated lake was named. Today, the Swiss Guards are remembered for defending their Queen, Marie Antoinette, heroically, to the death. Piece d'Eau des Suisses under a frost, December 8, 1840. 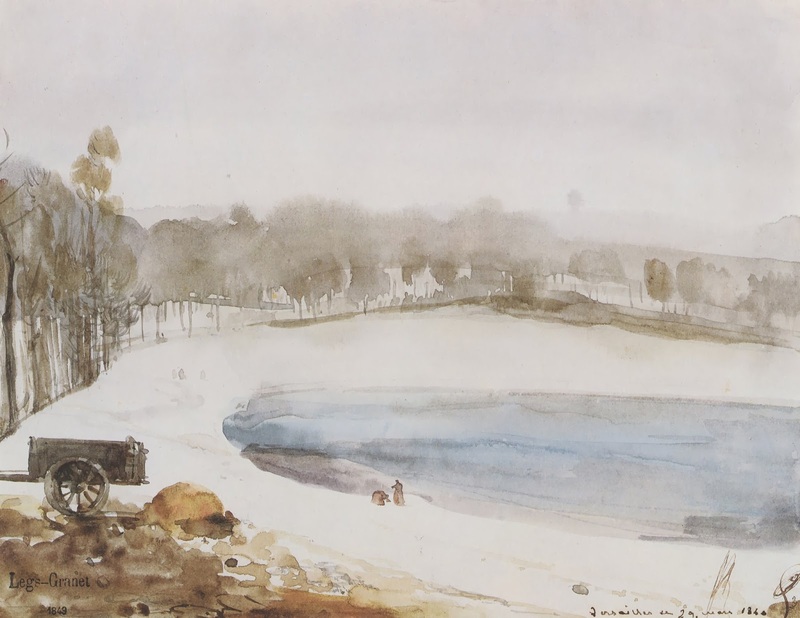 Granet scholar Edgar Munhall has suggested that Granet chose to paint the environs of the Lac du Suisses often because of his fascination with chiaroscuro generally, and the way that the seasons altered the balance of dark and light with the changed air and water temperatures Here, sans snows, the scene is washes of muted colors, brown and a delicate lavender-blue to indicate the presence of frost, as granet noted on the back of the paper, "the ground was covered with hoarfrost." 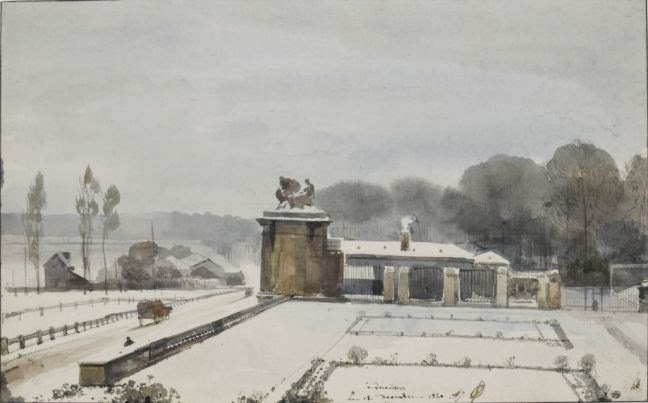 Maison de Jardinier seen from the Bois de Satory, December 12, 1840. 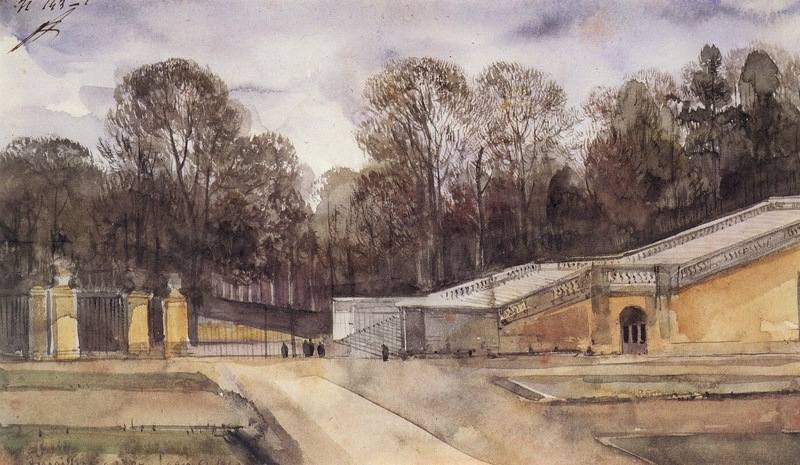 Entrance to the Park at Versailles near the Orangerie, Friday, December 18, 1840, Louvre Museum, Paris. Softly, gently, silently, snow falls. Snow undisturbed by the to-and-fro of human needs is a rare sight today. Maison de jardinier with the Bois de Satory, no date given. The Jardinier would have been the head gardener at Versailles, who doubtless worked closely with the King's royal garden architect supreme, Ander le Notre (1613-1700) in developing the Orangerie. The little house is close up and in the faraway nearby is the Bois de Satory (the Satory woods), a natural area that Granet often sought out. Everything appears fresh and bright in this picture, as on a spring day. 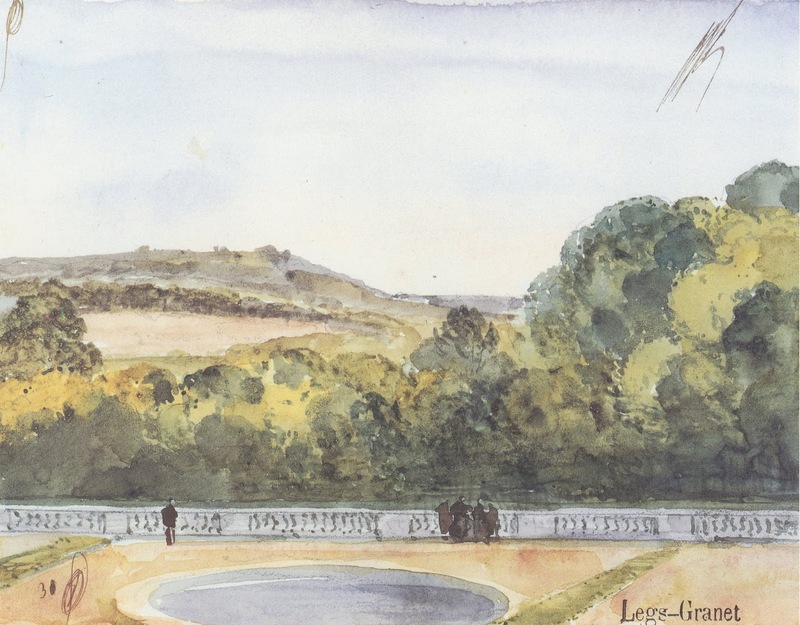 Landscape at Versailles, no date given, but probably mid-1840s. 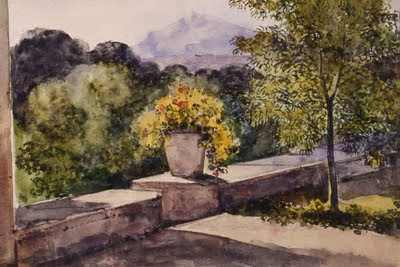 As time passed, Granet became more experimental in his watercolor drawings. We would say that they become more abstract but they are jewels of felt observation and meditation on a landscape he had come to know intimately. Piece d'Eau des Suisses et Bois de Satory, no date given, but probably mid 1840s. 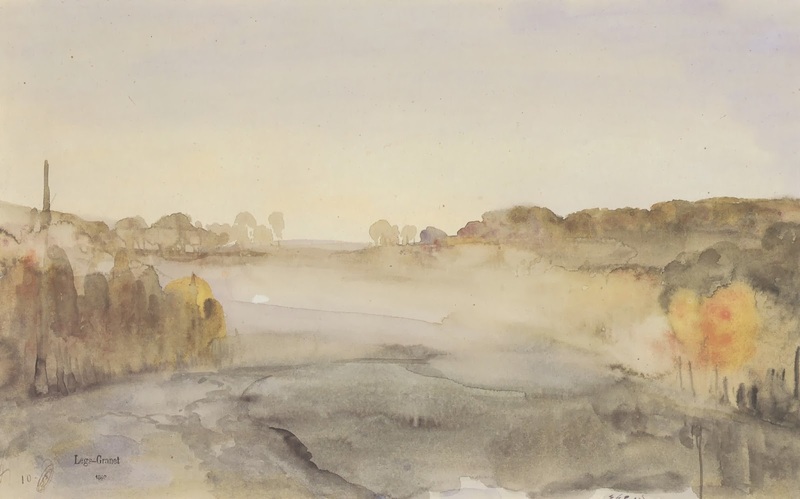 Pond of the Swiss in the Fog, no date given, but probably mid 1840s. Images: unless otherwise noted, all images are in the collection of Musee Granet, Aix-en-Provence. 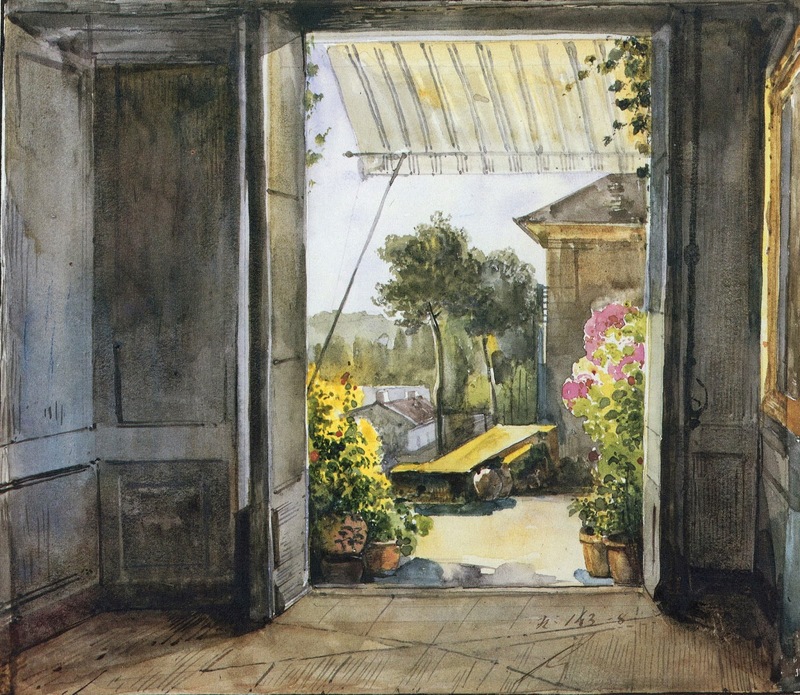 Francois-Marius Granet: Watercolors from the Musee Granet at Aix-en-Provence by Edgar Munhall, New York, The Frick Collection: 1988. Memoirs of the Painter Granet by Francois-Marius Granet, translated from the French by Joseph Focarino, 1988. Originally published in French by Le Temps, September and October, 1872. Watteau to Degas: French Drawings from the Frits Lugt Collection, on view at the Frick Collection in New York City October 6, 2009 - January 10, 2010. What a fascinating and detailed post! So glad I found your blog. Very interesting about Versailles: I love the south and on the few occasions I've stayed in Versailles (usually to break the journey back to England) I've felt profoundly uncomfortable there. How nice to hear from you and your website is interesting, so thank you. I don't think Versailles was ever intended to make visitors comfortable. Awe seems more like what the Sun King had in mind, and he got it. Granet's Memoirs are touching to read. He was not at all an affected character and his voice crosses centuries almost as though he were here in now.